Eau Claire artist Fred Sklenar’s self portrait for Chalkfest 2010 marked his second jazz/music-themed creation for the event. He plans to continue the theme in 2011. 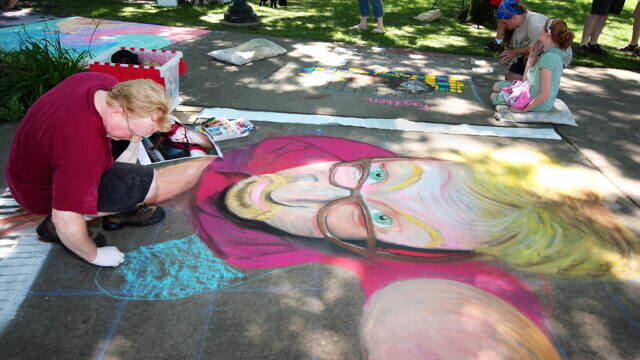 Armed with tubs of brightly colored chalk, utensils, and, in some cases, kneepads, dozens of professional and amateur artists will converge on Wilson Park (between Farwell and Barstow streets in downtown Eau Claire) for the fourth time on August 6. Together they will transform yards of tan city sidewalks into extravagant, large-scale chalk creations depicting everything from abstract works and movie scenes to cultural icons. By day, Sklenar assists in designs of consumer products for companies such as Nintendo, 3M, and Leinenkugels. By night, he creates pastel portraits, some of which reside in area businesses such as Mona Lisa’s, and fuels his musical passions of sax and piano. One of the event’s most revered artists, Fred Sklenar, will be putting chalk to concrete for the third time. You may recognize Sklenar’s previous Chalkfest entries, as both showcased his incredible attention to detail and passion for the musical arts. Sklenar’s inaugural piece(s) was a series of jazz portraits. “I have photography from a guy by the name of Herman Leonard, who did a lot of black-and-white photography in the 1950s of jazz musicians, which was my subject matter,” Sklenar explained. Over the course of six hours Sklenar brought to life 11 jazz musicians, recreating the likes of Barry Harris, Theloneous Monk, Ella Fitzgerald, and Charley Parker. His sophomore Chalkfest piece was reminiscent of a Chuck Close portrait – albeit with chalk on concrete, rather then paint on canvas – and depicted a bird’s eye view of himself looking up while playing a piano.